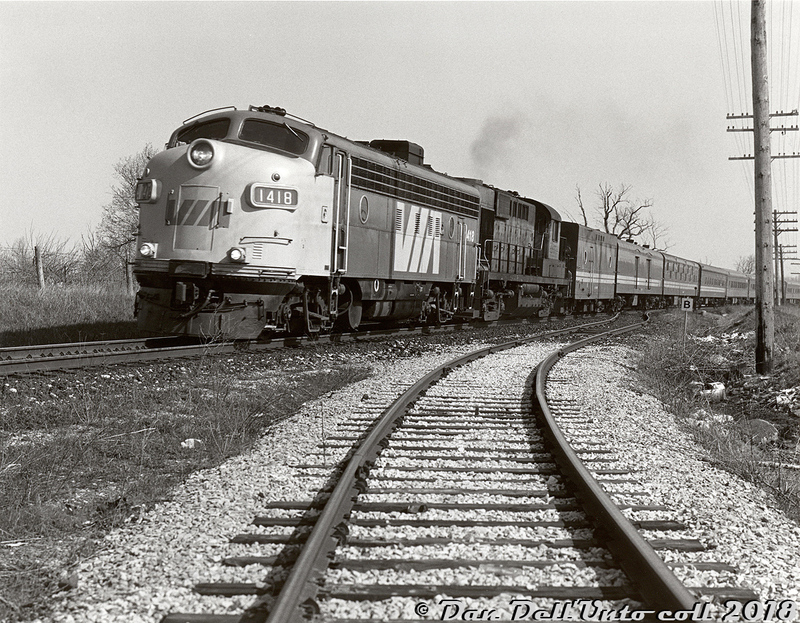 Railpictures.ca - David M. More photo, Dan Dell'Unto coll. Photo: Sporting a fresh coat of yellow and blue, ex-CP FP7 1418 and ratty script-livery CP RS10 8576 Handles VIA’s “The Canadian” out of Toronto northbound over CN’s Newmarket Sub through Concord (Vaughan), passing the old Rivermede Developments spur at Mile 14.8 that branched off to serve the industrial area around Bowes Road, just north of present-day Rivermede Road. South of here down at Highway 7 was once the former location of CN’s Concord Station, which had fallen out of use in the 1970′s and was demolished a year earlier in 1978 (see Arnold Mooney’s photo here. The mixed consist of blue & yellow ex-CN and stainless steel ex-CP passenger cars was typical for VIA at the time, as was the steam generator-equipped CP RS10 (since the remaining Alco/MLW 244 power was being phased-out during this time, CP wasn’t spending any money on painting units facing retirement). But, former CN and CP passenger units sold to VIA tended to remain separate and didn’t mix with each other in the same consists, with the exception of ex-CP units upgraded to CN standards by Pointe St. Charles shop for VIA (VIA 6550+ and 6650+ units). Both roads also often supplied backup power to VIA – in CP’s case it was usually their handful of GP9′s and RS10′s equipped with steam generators. David M. More photo, Dan Dell’Unto collection print. | Railpictures.ca – Canadian Railway Photography – photographie ferroviaire Canadienne. Copyright Notice: This image ©David M. More photo, Dan Dell'Unto coll. all rights reserved. Caption: Sporting a fresh coat of yellow and blue, ex-CP FP7 1418 and ratty script-livery CP RS10 8576 Handles VIA's "The Canadian" out of Toronto northbound over CN's Newmarket Sub through Concord (Vaughan), passing the old Vaughan Acres Industrial Lead at Mile 14.8 that branched off to serve the industrial area around Bowes Road, just north of present-day Rivermede Road. South of here down at Highway 7 was once the former location of CN's Concord Station, which had fallen out of use in the 1970's and was demolished a year earlier in 1978 (see Arnold Mooney's photo here). The mixed consist of blue & yellow ex-CN and stainless steel ex-CP passenger cars was typical for VIA at the time, as was the steam generator-equipped CP RS10 (since the remaining Alco/MLW 244 power was being phased-out during this time, CP wasn't spending any money on painting units facing retirement). But, former CN and CP passenger units sold to VIA tended to remain separate and didn't mix with each other in the same consists, with the exception of ex-CP units upgraded to CN standards by Pointe St. Charles shop for VIA (the 6550+ and 6650+ F-units). Both roads also often supplied backup power to VIA - in CP's case it was usually their handful of GP9's and RS10's equipped with steam generators, as was the case here. David M. More photo, Dan Dell'Unto collection print. Thanks Stuart. Unfortunately I only have about two or three of David’s shots, but have seen a few neat photos of his floating around online and in the Dean & Hanna CPR book. I had heard when he passed on, his collection was dispersed. Once again, much appreciate the detailed caption, Dan. Thanks as well for sharing one of Dave More’s fabulous images. Dave was a dedicated rail fan and a talented photographer and it’s great to see his material surfacing for everyone to enjoy. Please keep it coming.